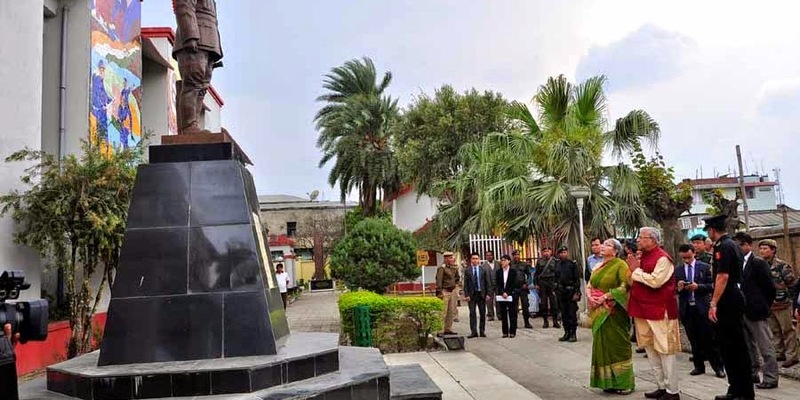 IMPHAL, Mar 5 (NEPS): Governor of Nagaland PB Acharya along with his lady wife visits Indian National Army (INA) Museum at Moirang, Manipur on Wednesday. The Indian National Army (INA) War Museum in the INA Memorial Complex in Moirang is the only official museum dedicated to the Second World War in Manipur today. Its focus is primarily on the rise of the INA and on the role and activities of Netaji Subhash Chandra Bose in particular. Relics of war from across Manipur dating back to 1944, including arms and ammunition, bayonets, helmets and bottles, among others, are also displayed here. During World War II, Moirang was the headquarters of Azad Hind Fauz. Colonel Shaukat Malik of the Indian National Army, (INA) hoisted the Tricolour for the first time on Indian soil on 14 April 1944, in Moirang with the help of Manipuris like Shri Mairembam Koireng Singh and others who were members of the INA. Moirang is a city and a municipal council in Manipur’s Bishnupur district. It is the largest tourist town in Bishnupur District. Moirang is a town situated 45 km south from the state capital, Imphal. It has an area of 269 km² with a population of 62,187 (BPL Survey) in 67 villages. Loktak Lake, the biggest fresh water lake in the North East Indian region and Keibul Lamjao National Park are situated in this district. There are 12 Gram Panchayats in this block.